I've been making my own ricotta cheese for several years now, and I just have to say that there really is NO comparison with the store-bought stuff in plastic tubs at the supermarket. This stuff is incredibly creamy and delicious. Over the years, I've tried a few different methods (they all use either vinegar, lemon juice or buttermilk as the active ingredient), but I think I’ve finally found the one that I think produces a really lovely, soft curd. It comes to me via The Home Creamery, a wonderful collection of cheese recipes for the home kitchen, and my go-to resource for all things cheese-y. The difference with this recipe is that it recommends letting the cheese sit for 2 hours after innoculation (which I've never done before) to let the curds separate from the whey, which I think makes a big difference in the quality of the curd (creamy and luscious). So here are the ingredients you’ll need… Just 3 things...Really fresh, high quality milk (whole milk is the best), white vinegar and salt! Now just pour the milk into a heavy-bottomed pan and over medium heat, bring it up to 185 degrees. When the milk reaches 185 degrees, remove it from the heat and add 1/3 cup vinegar and 1 tsp salt. Gently stir to incorporate the vinegar (you'll see the curds already starting to form) and then put the lid on the pan and just let it sit for 2 hours. Set a colander in the sink and line it with some cheesecloth. Pour or ladle the curds into the cheesecloth. Either tie the ends of the cheesecloth together or use some twine to hang the cheese to drain for an hour two. I sometimes give the bag a little squeeze from the top to hurry this process along. Drain time all depends on how fine your cheesecloth is and how dry you like your ricotta. Place the ricotta in a bowl or tupperware. 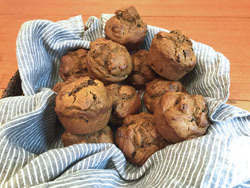 It will keep for a week in the fridge, but believe me, you'll want to use it immediately. It's pretty darn scrumptious. Here are some ideas for ways to use your beautiful ricotta cheese. 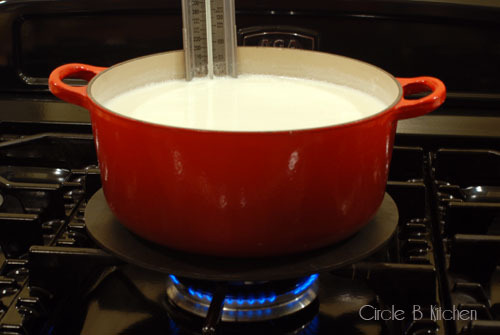 Heat the milk in a large, heavy-bottomed pan until it reaches 185 degrees. Remove from the heat, add the vinegar and salt and stir gently just to mix. Cover the pot and let sit for 2 hours to allow the curds to fully develop. Do not stir, or the ricotta will have a grainy texture. Line a colander with cheesecloth. Pour or ladle the mixture into the colander carefully and let the cheese drain for 1 to 2 hours, depending on how dry you want your ricotta. When the ricotta has drained, transfer it to a bowl, break it up and stir. Store the ricotta in an airtight container in the refrigerator for up to 1 week.